Look up “Eugenics boards in America” and you will see what belief in Evolution caused in AmeriKa. Behold the fruits of the religion of Evolution. Eugenics boards and Eugenics courts were part of America that actually influenced Adolf Hitler. Yet you will not learn about these truths in the history books used in the modern day American Public Fool Systems. Contrary to the lies of American and World History taught in the public schools where Hitler is often singled out as a mad man killing Jews, Hitler was actually motivated by both his religion of Evolution and the American Eugenics Movement. 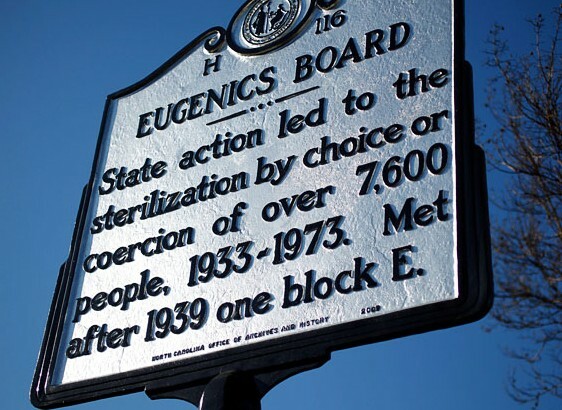 In early to mid 1900’s America hundreds of thousands of women were force sterilized in each State based on established “Eugenics courts” and “Eugenics Boards” where they would determine if someone (usually a female) was “fit for reproduction”. This went on until the 1960’s which was decades after WW II. Hitler just took this main stream and out in the open. His actual mistake was attempting to do it too quick. The truly brilliant mad men (think Rockefeller’s and Rothschild’s) do it slow and stealth. And today it is still alive and well via Planned Parenthood where almost as many black babies are deliberately killed than are born. Here is one such example of Eugenics in 1960’s AmeriKa! Elaine Riddick was 13 years old when she got pregnant after being raped by a neighbor in Winfall, N.C., in 1967. The state ordered that immediately after giving birth, she should be sterilized. Doctors cut and tied off her fallopian tubes. “I have to carry these scars with me. I have to live with this for the rest of my life,” she said. Here’s a pro Eugenics movie made in the early to mid 1900’s. At approx. 15 minutes in is one such scene where a young woman has been found to be unfit to reproduce. This was true Eugenics Indoctrination in AmeriKa! Here’s some more info on the religion of Evolution motivated Eugenics movement in AmeriKa! america, eugenics, evolution, forced sterilization, hitler, nazi, sterlilization. permalink. Shawn, just because you and Steve Anderson want to help fill the earth with a ridiculous number of disgusting little vermin, AKA “children,” doesn’t mean we ALL want to, or that we all “should!” I, for one, am 31 (almost 32, since you probably know my sign is Gemini), and would GLADLY take “the mark of the beast” if it meant NOTHING MORE than free and permanent “sterilization,” as you call it! That’s it! The government would only have to do ONE THING for me, and that one thing is, make me unable to EVER give birth to a child for as long as I live! I would swear allegiance to Satan right now if it meant that, just like a male or a pre-pubescent/post-menopausal female, I would also be a NON-IMPREGNABLE BEING!!! It wouldn’t matter that I’d still never exceed 5’4″, nor could I grow big muscles, or sing like Barry White, or bear my chest at the pool/beach (since all breast removals leave unsightly scars), or even be rid of my proportionally wide pelvis! I would feel a MILLION times closer to “maleness,” which I consider the “superior state of being” (you’re welcome), no matter WHAT you, Steve, or anyone says to the contrary! I consider behaviors desirable BECAUSE more males do them (i.e. my occasionally skid-marked underwear, for example), not because they’re truly “better” (or cleaner in this case). You see, the masculinity of something makes it “cooler” and “better,” no matter what it is, and YOU, as a man, should be flattered that I want to be as much like your kind (males) as possible. So no matter what any stupidly emotional person, usually a woman, tries to tell me about how “wonderful” it is to “create life,” or to “carry another human being inside your body,” I still envy males for their inability to get pregnant, as this is the biggest difference between male and female! I would rather KILL MYSELF than bring a child into this world, because that would be the end of life as “me” anyway. And for this, you really should be grateful, considering all that I’d do to it (especially if it were a BOY). I only wish that program was still around and would “coerce” me into having major parts of my reproductive system removed, because I’d have it done tomorrow if I could!! !